Its centrepiece is that the Grand Gallery, a heroically scaled, top-lit exhibition house activity thirty seven metres high and spanning nearly eighty metres, during which artists are commissioned to make large-scale works of art. Externally, the building’s kind is formed as AN erupted landscape. the complete deposit is washed-up into the bottom with solely the peaks of the roof visible at ground level. 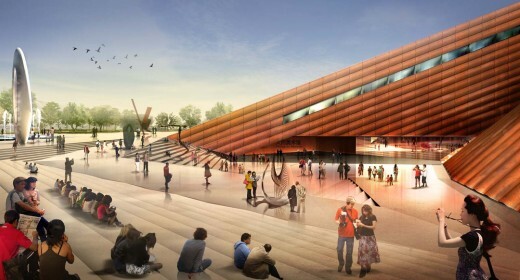 The roof is clad in earth-toned Corten steel, which is able to weather naturally over time. The building relates in scale to the 3 different cultural buildings within the cluster, equalisation the composition of the masterplan whereas increasing the interior volume of the Grand Gallery.